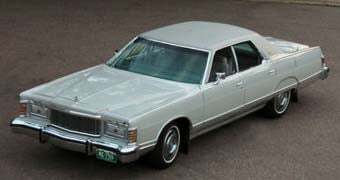 Nice Price Or Crack Pipe: 1978 Mercury Grand Marquis For $15,000? Sometimes you look at the price of a car for sale and you ask yourself, "Is that a pretty good deal, or would I have to be smoking the rock to pay that much?" That's what Nice Price Or Crack Pipe is all about, and we're going to follow up yesterday's high-buck factory-racer '63 Pontiac- which 65% of you felt went for way too much green- with another Detroit classic. This time it's a super-cherry 1978 Mercury Grand Marquis, a car with just 4,054 miles on the clock. This has got to be the nicest '78 Grand Marquis in the world, and it's got all the options: 460 engine, power everything, cruise control, even the 8-track player. But fifteen grand? What do you think? [eBay Motors], thanks to Mechimike for the tip! 15 thousand bucks for a 1978 Mercury Grand Marquis?